One of the major debates that arise when discussing about hair extensions is the question of whether or not human hair extensions are better than synthetic extensions. In truth, the answer absolutely depends upon what your particular lifestyle requires and how much money you want to spend on your extensions. This article is designed to help you determine whether human hair extensions or synthetic hair extensions are the best fit for your hair and your lifestyle. How Are Synthetic Hair Extensions Made? Synthetic hair can be made out of a variety of substances. The hair extensions can be made out of blended fibers and typically include a variety of very small plastic fibers that have been designed to mimic the look and feel of real human hair. In addition to plastic, makers of synthetic hair extensions may use Acrylic or polyester fibers to make the extension look more authentic. However, if a hair extension is labeled as synthetic, it contains no human hair at all. How Are Human Hair Extensions Made? Human hair extensions come from collecting human hair. The actual collection method depends upon what type of human hair extension you purchase. Remy hair extensions are collected from one donor and are typically collected by gathering the hair into a ponytail before cutting it. This style is also best if you are worried about potentially tangling your hair extension. Other styles of hair extensions may come from multiple donor sources. 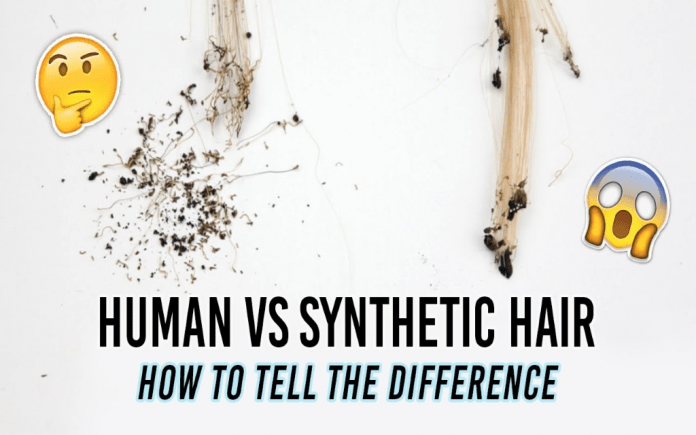 Are Synthetic and Human Hair Extensions Different in How They Look and Feel? Some people believe that synthetic hair extensions provide a greater variety of styles, but that simply isn’t true. Both human hair extensions and synthetic extensions can be purchased in a vast array of colors and styles. Both options also offer you a variety in application methods. Synthetic fibers range in quality, but typically are very stiff in comparison to human hair extensions. Since they are so stiff, they also frequently just don’t blend as well with natural hair as extensions made from human hair do. Although the quality of human hair extensions can range depending on whether they are Remy, non-Remy or virgin hair extensions, overall the human hair extensions typically blends easier with your natural hair. Human hair extensions also feel more natural, whereas synthetic fibers are known for feeling coarse or wiry to the touch. Which Type of Extension is Easier to Color and Style? Most synthetic hair extensions cannot be dyed after they leave the manufacturer. The reason for this is that synthetic products are not made to withstand the harsh ammonia or bleach that is required for changing the color of synthetic fibers. Likewise, synthetic hair is not made to withstand heat, so curling, straightening, and blow drying your hair extensions are not recommended when you have synthetic extensions. Over exposure to the sun or harsh chemical styling products are also known to damage synthetic extensions. Overall, the style that your synthetic hair extension comes in when you first receive it is exactly the type of style that your extension must be kept in for the entire time you use it. In contrast, you may use real hair extensions the same way you use your hair. They can be colored, straightened, curled, and blow dried. Which Type of Extension Will Work Better for a Wedding? Many women choose to use both human hair extensions and synthetic extensions for a variety of special occasions. Weddings are particularly common times to use hair extensions, because people want to look their very best during the big day. In most instances, human hair extensions look the most natural and are the most versatile. However, if you are planning on getting married in a particularly humid or tropic location, synthetic hair extensions may be your best bet. The same is true if your wedding is going to be placed during a time in which you expect a lot of rain. How Much Will Each Type of Extension Cost Me? Synthetic hair extensions are much cheaper than real hair extensions. However, the primary reason for the lower price is that you are paying for a product that has a lower quality. This means that you will generally be required to replace synthetic hair extensions repeatedly during the course of a year, particularly if you are using them on a daily basis. Some synthetic hair extensions only last for up to a month, while others can last for up to 3 months. In contrast, extensions made from human hair can last up to a full year without needing to replace them. Although the initial price of the synthetic extension may be lower, you may end up paying more for synthetic extensions over the course of the year. In general, initial costs for human hair extensions range from $76 to $400, while the cost for synthetic hair extensions ranges from $50 to $85.